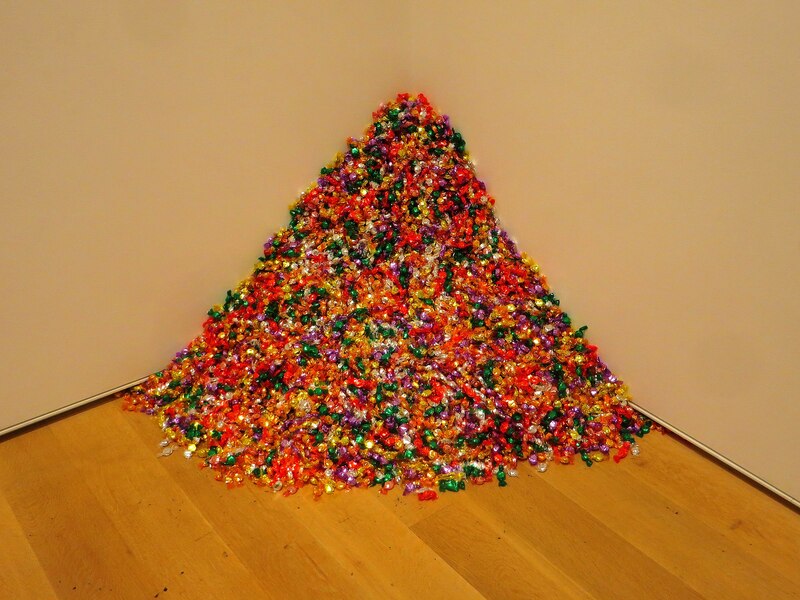 This Felix Gonzalez-Torres work may give you the sugar rush you need to keep gallivanting about the museum. But if you take a minute and analyze it, you might find that something more than candy and cellophane wrappers lie in this pile. Nonetheless, my sweet tooth is still starting to ache. Sadly, this piece is not sweet as you might think. This work encapsulates the dichotomy of love and pain, kind of like a sour gummy bear. This work is an allegorical representation of Gonzalez-Torres’s lover Ross Laycock. Like many members of the gay community, Laycock died of an AIDS related illness. The work consists of 175 pounds of candy; Laycock’s ideal body weight. Unlike most art, you are encouraged to touch the candy and even take some if you please. The shrinking pile of candy is supposed to represent Laycock’s dwindling weight as he moved towards his inevitable demise. Are you afraid that if we take too much Ross’s memory will be forgotten? Of course Gonzalez-Torres thought of this and required that whomever would come to own this piece would have to continually replenish the candy, thus metaphorically granting eternal life to his lover. Wait a second while we get the tissues. Gonzalez-Torres was a huge activist for the gay community and used his art as a way to speak and educate about the struggles of AIDS. Sadly, Felix himself would soon fall victim of the disease as well, and it would ultimately take his life in 1996. Maybe I am reading into it a bit too much, but this piece seems cannibalistic to me. And religious. It's like the Eucharist. By taking a piece, you are taking Ross with you, thus making him omnipresent. However you want to interpret it, there is no arguing that this is one of the sweetest portraits around.